Mindfully set your intentions or break a serious sweat. Our always-complimentary classes cover every aspect of your workout, from A to Z.
AB BLAST: Focus on your core and ab strength with this quick and powerful workout. BALLET TONE: An upbeat, ballet-based class designed to tone, sculpt and stretch your legs, glutes and arms, all while improving balance and core stability. BODY SCULPT: A full-body strength-training workout, this sculpting class makes use of weights and resistance bands. CHAKRA FLOW CLEANSE: Move through a detoxifying, slow Vinyasa yoga sequence that awakens your body's center and diffuses energy blockades. Salutations, mindfulness, pranayama breathing and asanas allow you to align each of your seven chakras and conclude the class with a renewed sense of balance. CHAKRA JOURNEY: Activate the physical, emotional, mental and spiritual elements as you engage in guided meditation and journey through the chakras. This session intends to strengthen the entire body with stretching, balancing and concentrated breathing. CYCLING: Challenge yourself with an invigorating cycling experience, conquering speed, resistance and distance combinations that rival mountains and rolling terrain. 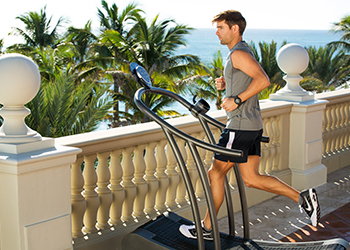 Complete the workout by pushing through rigorous sprint intervals that tone and build strength. FOAM ROLLING: Release muscle tension and increase your circulation with the use of a foam roller and your own body weight. FULL-BODY WORKOUT: Targeting all areas of the body, this high-intensity workout fuses strength training and core work. HIIT (HIGH-INTENSITY INTERVAL TRAINING): Maximize your workout with a combination of high- and low-intensity interval exercises, which boost metabolism and continue to burn calories—long after you’ve left the gym. MINDFUL MEDITATION: Improve your mood, stress levels and overall health by learning to quiet your thoughts and embrace the present. PURE TONING: Focus on toning and tightening your upper and lower body using light weights. RESTORATIVE YOGA: Revitalize your lower back with a relaxing series of stretches that leave you feeling open and refreshed. SOUL STRETCH: Enjoy the simplicity of this calm, restorative stretching class. Feel refreshed and renewed as you focus on lengthening and expanding your muscles with basic stretching techniques. 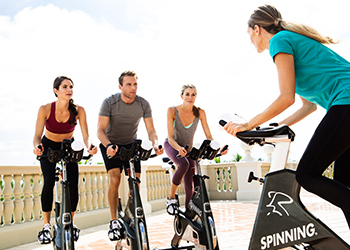 SYNRGY BOOT CAMP: With our fun and flexible Synrgy 360™ system, it’s as though you’re back on the playground. Train at your own level and focus on your specific goals, including stamina, strength, flexibility and speed. TRX STRENGTH TRAINING: Build total body strength and stamina with our expert TRX trainers in a private or group class. Discover this efficient workout for the first time, or engage in intermediate TRX training to take your fitness to the next level. VINYASA FLOW: A balanced yoga flow, this intermediate class is spaced with movements and connected by breath work to peacefully guide you through your practice. WATER AEROBICS: Designed for all fitness levels, this class proves just how heavy water can be. Come prepared for challenging runs and playful sprints that create little impact on your joints. YOGA: Awaken your energy and body with this fundamental series of stretches. For all classes, we ask that you please arrive 10 minutes prior to start time, as space is limited. Water classes are weather permitting.